Update: Missed the Ask the Governor Twitter Chat today? Catch up with this Twitter Moment. On Wednesday, March 1 at 2:45 P.M. we’re holding an Ask the Governor Twitter Chat. This is your chance to ask the governor about Pennsylvania government, his 2017-2018 budget, national politics, or anything else on your mind. 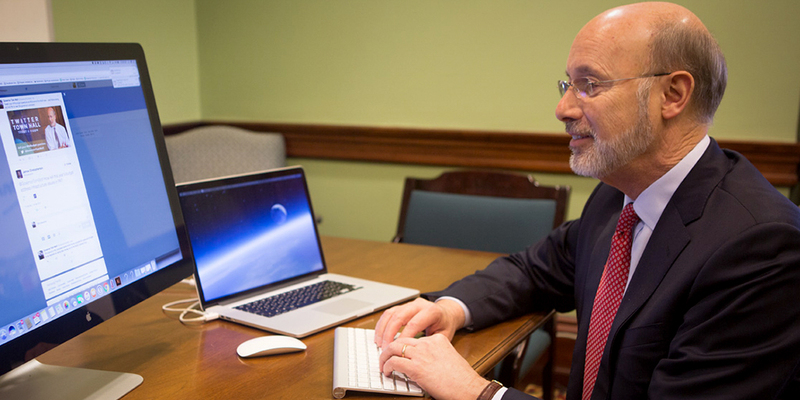 Check out these questions we’ve answered during Twitter chats in the past — and tweet us your questions @GovernorTomWolf. Asked about the Affortable Care Act.
.@mulderig Agree, repealing ACA would be disaster w/o viable replacement. 700k PA’ians have care b/c of Medicaid expansion. Asked about education in Pennsylvania.
.@LexieRoberts4U Yes investing in our kids is investing in our future. My #PAbudget invests more than $200 million in schools.
.@LexieRoberts4U We enacted a fair funding formula for our schools while investing $640 million to help them. @GovernorTomWolf YES! Thank you, Governor Wolf. Asked about the governor’s Jeep. Asked about non-discrimination in Pennsylvania.
.@GovernorTomWolf As per @ACLU, PA still lacks non-discrimination laws covering sexual orientation and gender identity—when will we get one? Asked about bipartisan legislative efforts. Asked about a severance tax. Asked about the state pension system. @GovernorTomWolf What do you think of the pension of state workers?? Don’t wait! Tweet the governor your question now.